Joseph McBride is a professor in the Cinema Department at San Francisco State University, where he has been teaching screenwriting and film history since 2002. He is an internationally recognized film historian, the author of nineteen books, including the acclaimed biographies Frank Capra: The Catastrophe of Success (1992; revised 2000), Steven Spielberg: A Biography (1997; revised 2011 and 2012) and Searching for John Ford (2001). McBride has published a celebrated book of interviews with director Howard Hawks, Hawks on Hawks (1982), and three books on Orson Welles, most recently What Ever Happened to Orson Welles? : A Portrait of an Independent Career (2006). 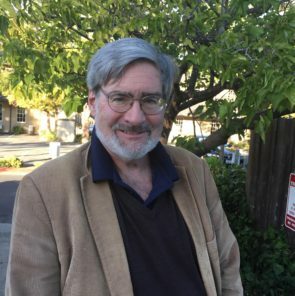 His latest books are his collection of fifty years of articles and interviews, Two Cheers for Hollywood: Joseph McBride on Movies (2018), and his critical study How Did Lubitsch Do It? : The Films of Ernst Lubitsch, which he began working on in 2009. McBride won an award from the independent critics covering the 2010 Locarno International Film Festival in Switzerland, as “The Most Important Personage” of the festival, for curating a complete retrospective of the films of Lubitsch, which later moved to the Cinémathèque Française in Paris. 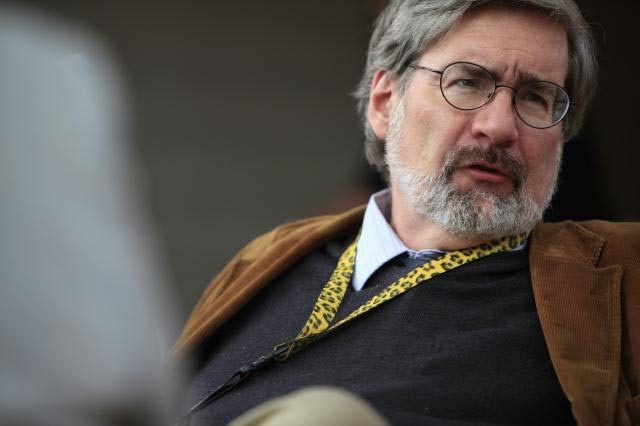 McBride was born in Milwaukee, Wisconsin, and has been a professional journalist since 1960, when he published his first article, a profile of his Little League teammate Greg Spahn and his father Warren Spahn, the great Milwaukee Braves pitcher, for the national publication Young Catholic Messenger. Since then McBride has written for such publications as Life, The New York Review of Books, The New York Times Book Review, The Nation, The Huffington Post, The Washington Post, The San Francisco Chronicle, The Los Angeles Times Magazine, Irish America, Oxford American, and film magazines including Sight & Sound, Film Heritage, Film Quarterly, Film Comment, Cineaste, Bright Lights, New Review of Film and Television Studies, American Film, DGA Quarterly, CinemaEditor, and the Writers Guild of America magazine Written By. He was a founder of the film journal The Velvet Light Trap, a reporter for The Wisconsin State Journal (Madison) and the Riverside (California) Press-Enterprise, and a reviewer, reporter, and columnist for Daily Variety in Hollywood for seven years off and on (1974-92). McBride’s books have been published in French, Italian, German, Polish, Spanish, Finnish, Japanese, and Chinese. The French edition of Searching for John Ford, A la recherche de John Ford, won the Best Foreign Film Book of the Year award from the French film critics’ organization in 2008. McBride’s earliest books were High and Inside: An A-to-Z Guide to the Language of Baseball (which he began writing in 1963 and published in 1980) and Persistence of Vision: A Collection of Film Criticism (as editor; 1968). His critical studies Orson Welles (1972) and John Ford (with Michael Wilmington, 1974), published by the British Film Institute, established him as a film critic and historian. From 1967 onward, McBride has written many articles, interviews, and reviews about film subjects for magazines in the U.S. and abroad; he also has written many articles and reviews for film websites. In recent years, as well as collecting his best pieces for Two Cheers for Hollywood, he has been concentrating to a large extent on the memoir form. What Ever Happened to Orson Welles? is partly a memoir of his work about and with Welles. The Broken Places: A Memoir (2015), deals with McBride’s troubled youth in Milwaukee and Madison. McBride was educated at St. Bernard’s Grade School in suburban Wauwatosa; Marquette University High School in Milwaukee; and the University of Wisconsin, Madison. The Broken Places was a longtime labor of love for the author, as was his 2013 book Into the Nightmare: My Search for the Killers of President John F. Kennedy and Officer J. D. Tippit. McBride was a volunteer in John F. Kennedy’s 1960 Wisconsin presidential primary campaign and appears in the classic documentary film about that campaign, Primary. McBride is a veteran film and television writer whose decades of experience in the industry have brought him a Writers Guild of America Award, four other WGA nominations, two Emmy Awards nominations, and a Canadian Film Awards nomination. McBride was one of the screenwriters of the cult classic punk rock musical Rock ’n’ Roll High School (1979) and cowrote five American Film Institute Life Achievement Award specials for CBS-TV, honoring James Stewart, Fred Astaire, Frank Capra, John Huston, and Lillian Gish (1980-84); he won the WGA Award for The American Film Institute Salute to John Huston (1983). McBride plays a film critic in Welles’s legendary unfinished film The Other Side of the Wind, for which McBride acted from 1970 through 1976 and cowrote his dialogue with Welles; the film finally went into postproduction in 2017 and will be released in 2018. McBride wrote the segment on war movies, War and Peace, for 100 Years . . . 100 Movies (American Film Institute/TNT), 1998, and co-wrote the 1982 United States Information Agency worldwide live television special in tribute to the Polish Solidarity Movement, Let Poland Be Poland. He is a member of the Writers Guild of America, the American Cinema Editors, and the Academy of Television Arts and Sciences, and was a founding member of the Los Angeles Film Critics Association. McBride co-produced the 1997 documentary Obsessed with “Vertigo”: New Life for Hitchcock’s Masterpiece and the 2002 documentary John Ford Goes to War. McBride was a consultant and interviewee for the documentary Becoming John Ford, released in 2007 as part of the Ford at Fox boxed set of DVDs, which won the “Film Heritage” award from the National Society of Film Critics and was chosen as “DVD of the Year” by Time magazine. McBride has made dozens of appearances in documentary films, mostly on film subjects, and has done audio commentaries for numerous films on DVD and Blu-ray, including a forthcoming edition of Billy Wilder’s Irma la Douce and nine John Ford films, most recently Young Mr. Lincoln. McBride has appeared in filmed interviews for the Criterion Collection DVDs and Blu-rays of films directed by Welles (Othello, Chimes at Midnight) and Lubitsch (Design for Living). In 2011, McBride became the subject of a feature-length documentary, Behind the Curtain: Joseph McBride on Writing Film History, written and directed by Hart Perez. McBride lives in Berkeley, California. His partner is author and teacher Ann Weiser Cornell. McBride’s personal website is josephmcbridefilm.com. He also has websites for Into the Nightmare, The Broken Places, and Two Cheers for Hollywood. 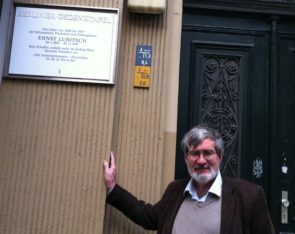 Joseph McBride at Locarno, Switzerland, Lubitsch retrospective, 2010. (Locarno International Film Festival). Joseph McBride (Ann Weiser Cornell).